French food is notorious for being full of butter, cheese, and of course, wine. In case you’re unsure of where to get your fix, we happen to know quite a few excellent spots throughout Nebraska to get it all. Whether you’re looking for the perfect place for a first date, a meal with close friends, or a fancy night out, here are eight of the best French restaurants and cafes in Nebraska. Chef Paul Kulik presents his take on the comfort foods of rural France at Le Bouillon in Omaha. Sourcing the best ingredients from local producers, Le Bouillon’s comfort foods include fresh salads, sandwiches, quiches, soups and more all served in an open, alluring space. The Green Gateau is a casual yet elegant European-inspired bistro that serves French and American food, as well as a popular brunch. Fresh breads, soups, and beautiful cakes make this the perfect spot for a night out with friends or loved ones. 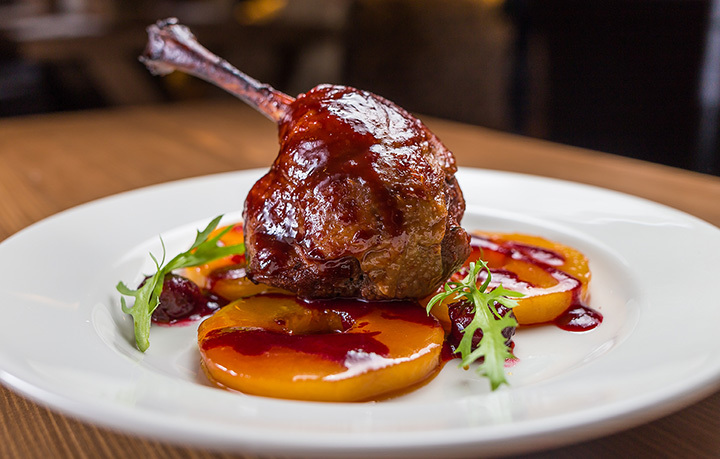 Le Voltaire is a French chef-owned restaurant serving traditional French dishes along with an extensive wine selection. After more than 15 years in Omaha, “the little corner of France in West Omaha” is now one of the finest restaurants in the city featuring French classic cuisine in a romantic south of France atmosphere. If you haven’t tried Le Petit Paris in Papillion, head there now because you won’t be disappointed. From artisan breads to lunches to-go, Le Petit Paris offers a wonderful, friendly atmosphere to enjoy breakfast, brunch, or lunch any day of the week. Stop into the Normandy in Lincoln for an unforgettable taste of fine French cuisine. With an expertly-crafted menu, curated wine list, and intimate atmosphere, a meal at The Normandy is one to remember. Dario’s Brasserie in the heart of Omaha’s historic Dundee neighborhood is owned by chef Dario Schicke and serves beer, wine, and simple hearty French food. The cozy and comfortable bar area is the perfect spot to enjoy an intimate meal cooked from the freshest ingredients. In downtown Scottsbluff, Cafe de Paris is a classic French cafe with a twist. Stop in for French cafe classics and sweet treats like homemade cupcakes, cookies, and fresh coffee. Lunch plates are also available. With roots in Dundee, Mark’s Bistro supported the local Omaha community by sourcing their meats and produce from local and regional vendors. They also grow many of their own herbs and vegetables on their rooftop garden to create dishes with a hint of French influence, balanced with some Asian accents, along with good old American and Italian bistro standbys.